Podcasts can improve your life exponentially in literally as little as 30 minutes a day. Listening to podcasts is a way for you to get free education while doing other things – like driving, getting ready, or cleaning your house. I am obsessed with podcasts. I listen with the intent of learning (as opposed to entertainment) and typically listen to at least one every day (usually more). I started listening to personal development, money, and business podcasts 4 or 5 years ago, and have been hooked ever since. I have my own podcast, called Design Your Dream Life With Natalie Bacon that is turning out to be a fan favorite. So, if you’re looking for motivation, check it out. Below is a list of the best personal development podcasts. 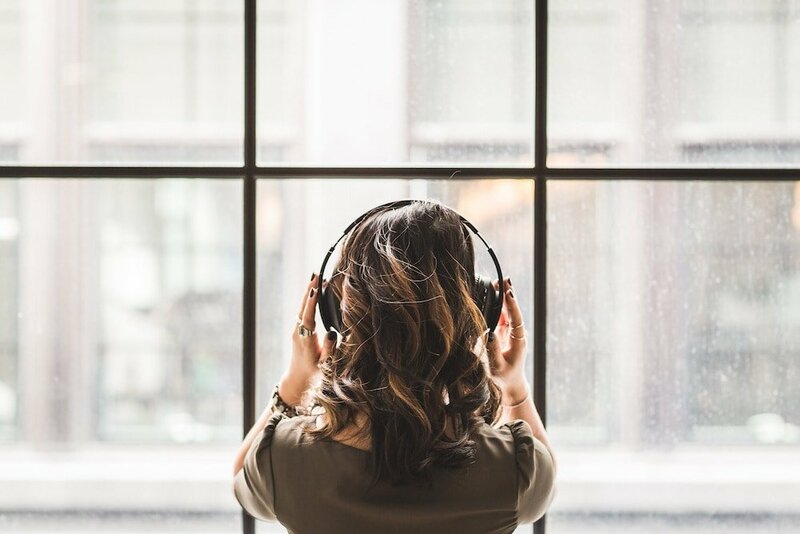 This list includes podcasts about personal growth, success, happiness, self improvement, minimalism, and more. Side note – before you start, join the free personal development training where I show you a new way of mastering your mindset that will give you the results you want most in your life! The Life Coach School Podcast by Brooke Castillo is a podcast about solving any problem you have in your life. Topics include how to feel better, how to take more action, how to set goals, how to love more, how to beat procrastination, how to manage your time, etc. There’s a model Brooke teaches that you can use to solve any problem in your life. The show is typically 25-40 minutes of Brooke teaching a life lesson. This is the best personal development podcast I’ve ever listened to. It has been the #1 biggest influence in changing my life. I’m happier, healthier, and produce more because of this podcast. I can’t say enough about it. I have listened to every single episode multiple times. My advice is to listen to at least 10 episodes if you give this one a try – just 1 episode isn’t enough to get the gist of it. And make sure you start from the very beginning because they get more complex and build off each other. The Brendon Show by Brendon Burchard is a podcast about how to live, love, and matter in this world. Brendon is author of High Performance Habits, and on the show he talks a lot about strategies you can use to improve your life. Bredon is a personal development guru and it comes through on the show. His style is very high energy, positive, and professional. You probably won’t find him swearing or telling a raw story about himself. However, you will get practical tips backed by research that you can use in your life and see real results. There are two episodes per week – one is a tactical training on how to improve one area of your life, and the other is Brendon’s recap of his week’s adventures, service and lessons learned. I like to sprinkle in this podcast with my other ones, listening to one per week usually. The School Of Greatness is a podcast with Lewis Howes (a Columbus, Ohio native! — never mind the New York Times Best Selling author, speaker, and multi-million dollar entrepreneur) where he interviews some of the most successful and interesting people. The goal of the School of Greatness is to share inspiring stories from the most brilliant business minds, world class athletes and influential celebrities on the planet; to help you find out what makes great people great. The episodes are typically about an hour long. There is almost always a life lesson that you can take away from a School Of Greatness Episode. It’s one of my favorite podcasts. The guests are really incredible. You can also watch this podcast in video format on the YouTube channel. The Tony Robbins Podcast is a podcast where Tony Robbins shares strategies and tactics used to achieve massive results in business, relationships, health and finances. Unless you’ve been living under a rock, Tony Robbins does not need an introduction! And in typical Tony Robbins fashion, this podcast will motivate the heck out of you. In addition to excerpts from his signature events and other exclusive, never-before-released audio content, Tony and his team also conduct interviews with the most prominent masterminds and experts on the global stage. Knowledge For Men by Andrew Ferebee is a podcast about wealth, relationships, personal growth, and health. Knowledge For Men is one of my favorite podcasts episodes, in part, because I’ve been with it from the beginning. Yes, I have been listening to a podcast designed for men for several years! Most of the episodes are not men-specific (and for the ones that are, I usually skip). There’s one new episode every week where Andrew interviews some of the best and brightest minds. Most of the episodes involve Andrew interviewing some super interesting or successful entrepreneur about life, business, success, or personal development. The interviews are typically very inspiring, and I always feel like I learned something new after I listen. Your Move is a podcast where Andy Stanley shares a 30 minute message that will help you make better decisions and live with fewer regrets. The podcast is Christian-based, but there is a lot of personal development and growth in each episode — so much that I couldn’t not include it on this list. Unlike other Christian podcasts that are motivational or scripture focused — Andy Stanley takes daily struggles and turns them into lessons that you can use to reframe what’s going on in your own life. Whether you’re a Christian or not, this podcast is an amazing place to get personal development lesson from. This is one of my absolute favorite podcasts. I turn it on every Monday morning and listen while I’m getting ready in the morning. It’s a great way to start the week. The Jordan Harbinger Show is a spin off from The Art of Charm by the original founder, Jordan Harbinger. The Art of Charm is the OG of personal development podcasts, in my opinion, so listening to Jordan’s new show was a no brainer (if this is the first you’re hearing of him, look him up – he’s pretty amazing!). Jordan is also a former lawyer, so I’m particularly interested in his journey, which is similar to mine. Jordan’s podcast is a combination of lessons and interviews with the brightest and most interesting people in the world. He focuses on new strategies, perspectives, and insights you can’t find anywhere else. Then, takes these insights and applies them to real life. My favorite Episode: Simon Sinek | What’s Your “Why” and Where Do You Find It? 10% Happier is a podcast hosted by Dan Harris, who infamously freaked out on national television while reporting as an ABC News Anchor (he’s also a New York Times best selling author, among other things). He had an anxiety attack on live television. Now, he is a meditation and personal development entrepreneur. On his podcast, he interviews big thinkers about meditation and life – he dubs his podcast “Meditation for Fidgety Skeptics”. Dan talks with smart people about whether there’s anything beyond 10%. Basically, here’s what this podcast is obsessed with: Can you be an ambitious person and still strive for enlightenment (whatever that means)? What I love about Dan is that he takes meditation out of the “woo woo” hippy space and makes it applicable for the average person in Corporate America. He show is full of applicable takeaways that you can use in your life. Joshua Fields Millburn & Ryan Nicodemus talk about everything from simplicity to clutter to happiness to balance to friends to finances — and everything in between. The show is longer than most, so you really have to be committed (or be okay with not listening to the entire episode if you want to listen from start to finish. The concepts are always on point though so it’s worth the time. Happier is a podcast by Gretchen Rubin, the bestselling author of The Happiness Project and Better Than Before. Gretchen gives practical, manageable advice about happiness and habits. Gretchen’s cohost and her younger sister, Elizabeth Craft, is a TV writer and producer. Beyond The To-Do List is a podcast by Erik Fisher. On the show, Erik interviews pros about productivity strategies. The podcast episodes range from 30-60 minutes and typically are a combination of conversations and lessons. This is a great podcast to throw into the mix when you’re looking for new ways to grow on a daily basis. Marie Forleo hosts her own podcast where her goal is to help you become the person you most want to be. Marie and her guests share strategies for greater happiness, success, motivation, creativity, productivity, love, health, contribution and fulfillment. The podcast covers topics like failure, fear, disappointment, success, business, marketing, and career. Marie’s podcast is inspiring, and it can help you grow into a stronger, more confident person and help you design a life you love. The Lavendaire Lifestyle is a podcast on personal growth and lifestyle design. Hosted by YouTuber and entrepreneur, Aileen Xu, this podcast shares weekly inspiration on how to create your dream life. New episodes released every Sunday. I am a big fan of Aileen’s and love her YouTube channel, so it was a no-brainer to start listening to her podcasts. One thing to note is that she takes a break from December through March and airs her show in “seasons.” So, you won’t find new podcast episodes during this time. Podcasts have been the #1 influence in my own personal growth. From money, to personal development, to blogging and business — I’ve learned the most from podcasts. And I don’t just learn this stuff — I apply it to my life. It’s free education. It is amazing. In time you’d otherwise waste (driving during your commute or getting ready in the morning), just by listening to one podcast a day, you can transform you life. Which are your favorites? Is there one you listen to that’s not on this list? Drop it in the comments below, and I’ll check it out and add it to this running list! Great list! I’m embarrassed to say I only listen to The Life Coach, I just love Brooke so much! I am definitely adding these to my commute. Steph recently posted…WAIT- I Need How Many Saving Accounts? If you’re going to listen to just one, that’s the one!!! 🙂 I think I’m going to start a podcast in 2019 that’s something similar but for young professional women! I LOVE this list! I listen to The Life Coach School because of you <3 and I honestly think it's a game-changer. Can't wait to listen to some of the others!! The Happy Hour is my fave! Love this list! I’m a huge fan of Gretchen Rubin’s work and I really enjoy their podcast as well! I think I might live under a rock, because I’ve never heard of Tony Robbins! I’m pretty sure that Laura Vanderkam and Sarah Hart-Unger were talking about him on one of their podcasts that I was listening to this morning. Theirs is another great one. It’s called “Best of Both Worlds.” It’s mostly targeted toward women who work and have small kiddos. I don’t have kids, so sometimes I skip episodes. They’re both really successful in their careers so I enjoy gleaning wisdom from them. Well you probably will hear about him now given the big controversy! LOL. Check out his book Awaken The Giant Within – it’s a total game changer! Tony Robbins is fantastic, another great one is Impact Theory from Tom Bilyue. It dives deep into getting into a growth mindset and how to tackle a lot of mental holdups. Thanks! I’m going to check it out. I am going to add Being Boss to my list of entrepreneurship / blogging podcasts – post will be coming soon! Thanks for the suggestion!! None of my favorites made your list. But I will check out Happier. I also like Christy Wrights Business Boutique and The Ken Coleman Show. Simple Pin Media has also been very useful for blogging. I agree podcasts are amazing and like you say its free education. Yes, these are specifically for personal growth and happiness. I have another post coming out for blogging and business podcasts! I absolutely love podcasts! My favourite is The Goal Digger Podcast by Jenna Kutcher. I think I already told you about that one, not sure? 10% Happier is another favourite. I teach meditation workshops myself and I remember when I spotted Dan’s book I was so happy someone so famous had discovered the power of meditation and was now sharing it with others 🙂 Lots of great inspiration in this list, thank you! Loving the Almost 30 Podcast. Started a year and a half ago and its amazing! Ahhhh thanks for the suggestion! I’ll check it out – love hearing about ones that I missed! Thank you so much for this post! I’ve been wanting to listen to podcasts on my drive to work each day but felt overwhelmed by where to start. After coming across your article a week ago, I’ve listened to the first 8 episodes from the life coach school and it is exactly what I have been looking for! I’ll be sure to refer back for some others too but for now I can’t get enough of Brooke’s lessons. I love the Acheive Your Goals with Hal Elrod podcast, I listen to it every morning!